It is our pleasure to introduce our office furniture division, hoping to establish a business relationship with your esteem company. We were the first manufactures of office partition systems in the U.A.E with the vision to provide customization in office partitions. During 11 years of our journey we specialized in providing customized workstations tailored made for different customers. We are now emerging into new markets and growing with our partners, a chain of 100+ well known office retailers in GCC, Africa and South Asia. With successful completion of over 1000 projects we looking forward to taking on more projects. Expanding our vision of providing customization in office furniture, we commenced a new furniture factory in the UAE to deliver latest contemporary trends to our customers in the shortest time possible. We have three different brands of office partitions (Tilo – Veto -Emco) with different thicknesses and features. Being the manufactures of office partitions, you get the power to select customization individually tailored for your office or for your client’s office. For example you can first choose the brand you like then we can provide different width and height of panels according to your space requirements. We believe every customer is unique; therefore their office should be unique as well. No more compromising with the ready-made partitions available in market when you have the power to customize your office to be unique. Working with you and taking in account yours or your client’s corporate identity we can offer different material finishes for partition panels. For example we can provide clear or sandblasted glass with logo – fabric or PVC in variety of colors – wood finish in melamine in variety of colors and patterns. Of course you can create combination of different partition finishes by selecting different materials. We can also integrate pin board, magnetic board and white board in our partitions for you. Further we can also provide different powder-coat colors of partition frames (the outer-structure). In short, we offer customization beyond imagination. We are importers and now the manufactures of office system furniture. Our aim is to provide contemporary furniture you or your client desires with uniform look and feel. Unlike what most people do: buy staff furniture from one retailer and executive furniture from another. Our office system provides a very unique and a uniform look and feel to an office. For example staff furniture and executive furniture comes with one type of table-base system. Only work top comes in different sizes and shapes according to work load of each person. 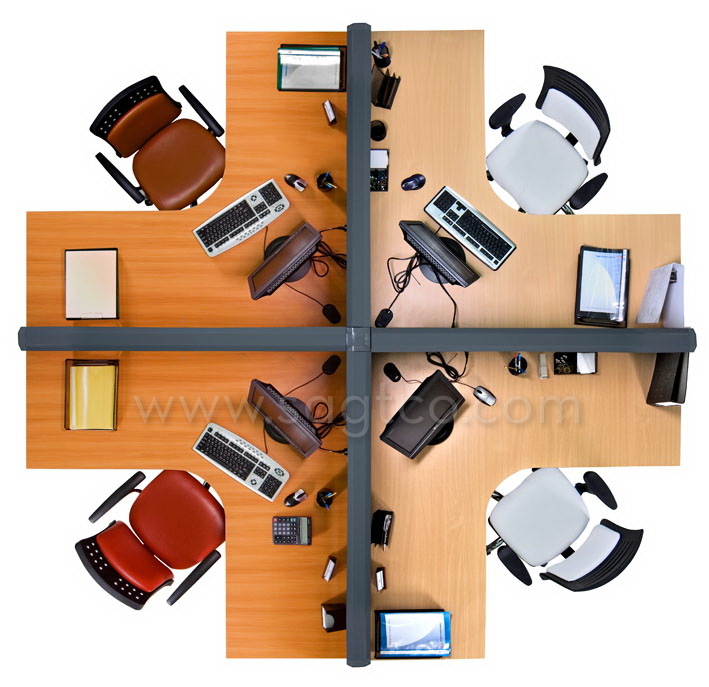 This ensures even though people working in different departments, having different table sizes and/or shapes, still look like an integrated part of a company; because all of their furniture have a uniform look and feel. Further meeting tables and reception desk can also be fabricated using the same table-base system which is used for staff and executive tables. We provide wire management option in table so you focus more on your task rather than covering an exposed wire mesh. The build in electrical and networking box ensures you are connected in the least time with least effort. In offices storage cabinets is an essential component but takes up a lot of space; so to overcome this challenge we provide integrated office storage cabinets and open shelves in different sizes which can be mounted on top of workstations panels. With variety of unique colors for office furniture you can no doubt choose the best to match yours or your client’s corporate identity. 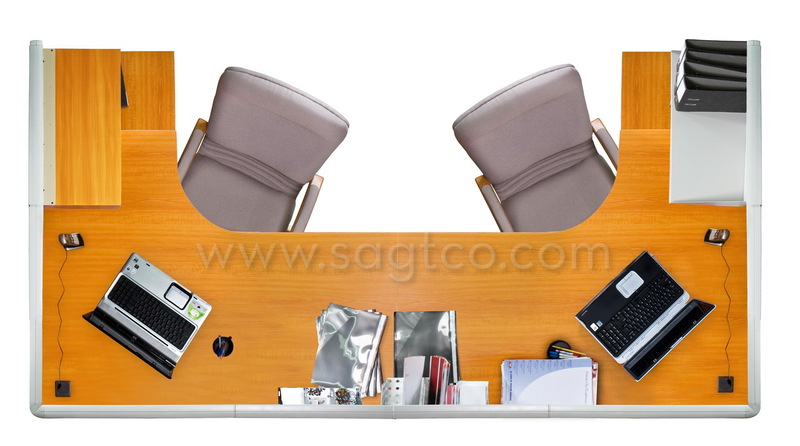 SAGTCO Dubai office furniture store is the top brands in the furniture business of the UAE. SAGTCO furniture store is an outstanding furniture organization in Dubai, UAE is having customer base all over the G.C.C.